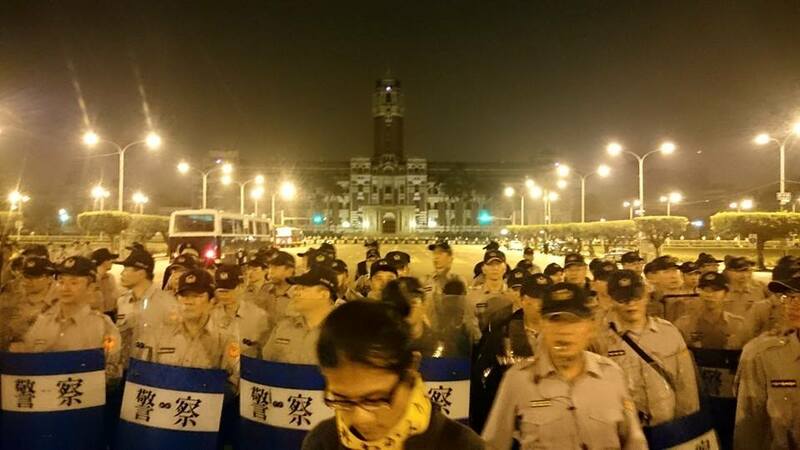 Police anticipate the protest against the AIIB application and its decision-making process with shields and barricades. Without consulting the public, the Ma Administration rushed an application to join the AIIB, Asian Infrastructure Investment Bank (亞投行). Taiwan applied on March 30, just before the March 31 deadline to become a founding member, sparking a protest in Taipei on the morning of March 31, 2015 that grew to about 600 people, according to a CNN iReport. China required that rather than applying like a normal country, Taiwan had to go through its Taiwan Affairs Office (TAO) since China considers Taiwan as a Special Administrative Region (SAR). Protestors prepare on the morning of 3/31/2015 that eventually swelled to approximately 600 people. The situation is reminiscent of how the Cross-Strait Service Agreement (CSSTA) was formed that ultimately led to the Sunflower Movement of March 2014. 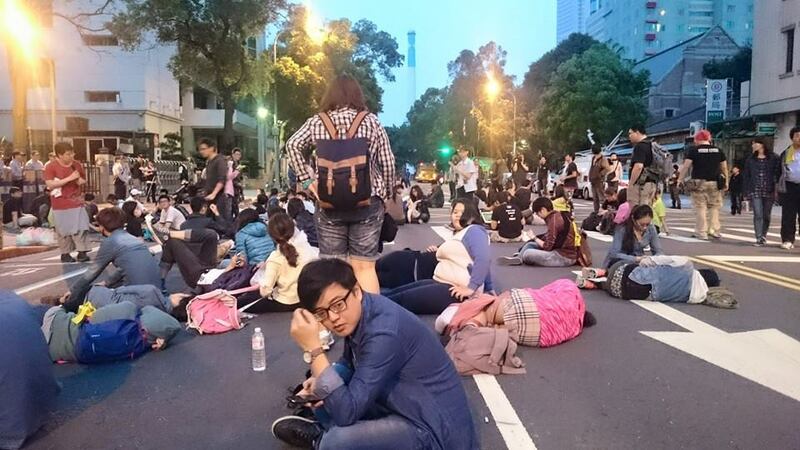 After finding out about the AIIB application, about 30 members of the Black Island Youth Front, a student-led group involved in the Sunflower Movement, tried to storm Presidential Building but were rounded up by police. The AIIB, is an international financial institution (IFI) proposed by China to invest in infrastructure projects around Asia. IFIs are institutions that provide financial support for developing countries. Other examples of IFI include the Asian Development Bank and World Bank, supported by Japan and USA respectively. More than 40 nations applied to become a founding member, with Taiwan, Australia and Norway being some of the last-minute applicants. What would be the pros of joining AIIB? If accepted into the AIIB, Taiwan would be a founding member, which possibly means it will have a leadership role in an international organization; a rare privilege to Taiwan. If an infrastructure project in Taiwan has a need for AIIB’s funding, Taiwan’s founding member position may influence the organization’s decision to support it. If projects are successful, Taiwan could eventually profit from its monetary investments into AIIB. What would be the cons of joining AIIB? For Taiwan, applying as a SAR through TAO could be sending a message to China that it is joining China. As long as Taiwan continues to send ambiguous messages about its sovereignty, it will struggle in defining its relationships with other countries and international organizations. The US and Japan did not apply – citing concerns about governance, environmental and social safeguards. Japan requested more information but did not receive a response; since the details are still unclear, the applicants are not certain of what they are signing up for and how it will be managed. The AIIB is regarded as a rival to the International Monetary Fund and Asian Development Bank, and it is unknown how the relationships will be shaped by the emergence of this new international bank. Update as of April 13: China has rejected Taiwan’s application to become a founding member, citing Taiwan can apply for membership in the future and suggested that further discussions will be required to decide on an “appropriate name” for Taiwan. Taiwan cabinet spokesman, Sun Li-chyun, says “Chinese Taipei” is Taiwan’s bottom line for acceptable names, although the Administration has not disclosed what name it used in the application. Taiwan participates in the Olympics and World Health Organization as “Chinese Taipei,” and is known as “Separate Customs Territory of Taiwan, Penghu, Kinmen and Matsu” in the World Trade Organization. ← Happy birthday, Outreach for Taiwan!